So, apparently there's this book that's getting a lot of great reviews, so naturally, I read it. After reading some reviews, I was curious about reading this book as my "book about a culture you're unfamiliar with." 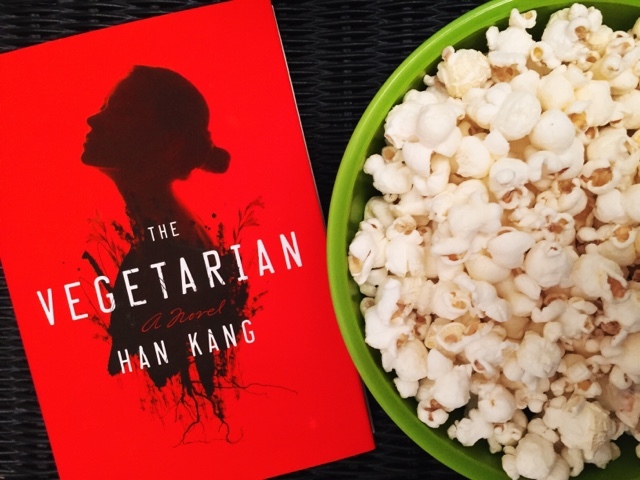 I figured this book was going to be about a Korean woman who became a vegetarian and was ultimately shunned by her friends and family. I guess, long story short, that is what the book is about, but it's on a deeper level than that. It is a haunting novel about mental illness, and the perspectives that those around a person with mental illness have of them. Or maybe I have it all wrong. I haven't seen any other review that refers to mental illness when discussing this book. I'll go ahead and say I wasn't really a fan of this book, and I wouldn't actually recommend it to others. Every review I've read has been full of praise, but I was somewhat thrown here and there and back and forth. The novel is a three-parter. It was originally published in Korea as three separate novellas, and was combined together as a full-length book for the English translation. The entire novel is about a woman struggling with who she is and the needs she has, or from my viewpoint - mental illness. The first part is told from the viewpoint of her husband, the second part is told from the viewpoint of her sister's husband, and the third part is told from the viewpoint of her sister. While I think this could be an interesting method for another book, I didn't feel it was well-written in The Vegetarian. While it's not so much that the point of views are changing, but the tenses change back and forth, which is very confusing. Perhaps that could be some sort of issue with the translation. During the first part, there are a few italicized sections that I believe were from the viewpoint of the main character, Yeong-hye, but you never actually hear very much from her point outside of those couple of paragraphs. I'm not sure that I've ever read a book where the main character isn't telling the story, or you aren't getting any kind of input about that character's thought or feelings. You're only reading from the perspectives of those around her, and I feel that doesn't give you the full story. I would have enjoyed at least getting one part from her point of view, so that I could have understood what was actually going on and what was happening. I really never fully understood all aspects of the story, and I felt as if it ended very abruptly. I really was not impressed with this novel, as everyone else seemed to be. For a short 188 page book, it took my close to a full week to read. Truthfully, I feel like it could make an interesting thriller movie with proper edits.As a book, however, I was not feeling it. Have you heard anything about this novel, or have you read it? What were your thoughts? I would truly love more input, as I was pretty confused once the book ended. For more information on this novel and its author, visit the Penguin Random House website.